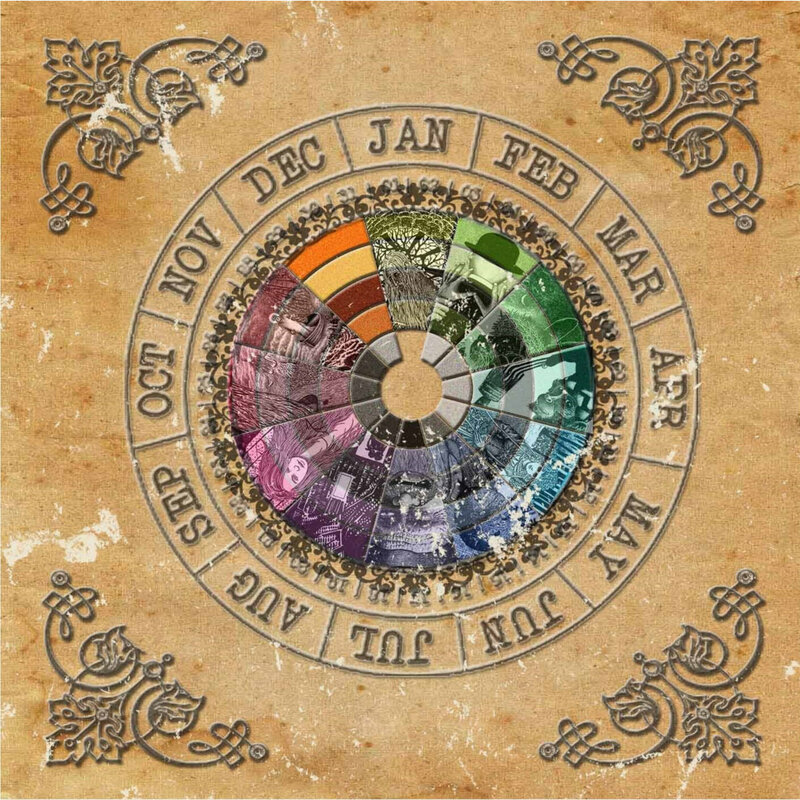 Following the cult success of “Songs from the Black Meadow” in 2016, Chris Lambert is set to bring more delight to all those who enjoy the curious, magical and mythical with the release of the Wyrd Kalendar album which is published by Mega DoDo. The strange, or more appropriately, wyrd stories of the calendar months which are to be found in the book of the same title provide the starting point for each of the artists on this remarkable release. A captivatingly diverse musical landscape opens out before us and quickly seduces the listener into an enchanting world of folk, electronica, psychedelia and forgotten horror soundtracks. The new year is heralded in with Widow’s Weeds (led by Grey Malkin, formerly of The Hare and the Moon) with their occult tinged hymn Song for January. This sets the tone for an unsettling but captivating hour. The imaginative electronica of Keith Seatman leads us on before the talented psych-folk singer Emily Jones brings to life the words of her long dead ancestor in Waiting for Spring. And then, before we know it, Crystal Jacqueline is playing us all for fools as she goes Chasing the Gowk. A personal favourite of this reviewer is the song for May, as Ghost Box’s Beautify Junkyards provide Portuguese pastoral enchantment in the form of May Day Eve. Those people who had the good fortune to see Beautify Junkyards on their recent visit to these shores will be happy indeed with this sweet vernal offering. Soon we feel the warmth of the sun on our backs as Alison O’Donnell of Mellow Candle, Flibbertigibbet, Firefay and United Bible Studies teams up with David Colohan in the wasp celebration of Deadly Nest. The second half of the year unfolds with Scarfolk collaborator Concretism treating us to the vivid imagery of A Fair by the Sea and Icarus Peel exploring lost love and yearning in the musical lament The Weeping Will Walk. The mellow mists of Autumn begin to fold around us as folk rock duo Tir na nOg invite us to raise a seasonal glass mbine and then it is the turn of Wyrdstone to immerse us in the haunting harvest celebration of The Field. The year concludes with the ever delightful Rowan Amber Mill who sing us out with The Witch’s Lament. A final gift comes in the form of the album’s closing titular track by the shape-shifting talents of The Mortlake Bookclub. This album and the accompanying book illustrated by the hugely talented Andy Paciorek are the fruits of rich imaginations at work. You would be foolish indeed to consider going through the year in any other way!